by Brianna Crandall — April 4, 2018 — Dune, seating designed by pioneering Swedish design studio Front for Offecct, offers a response to the constantly changing needs of today’s workplaces and public spaces. Dune was developed for the spheres where the need for informal meetings intersects with the demand for relaxed seating. 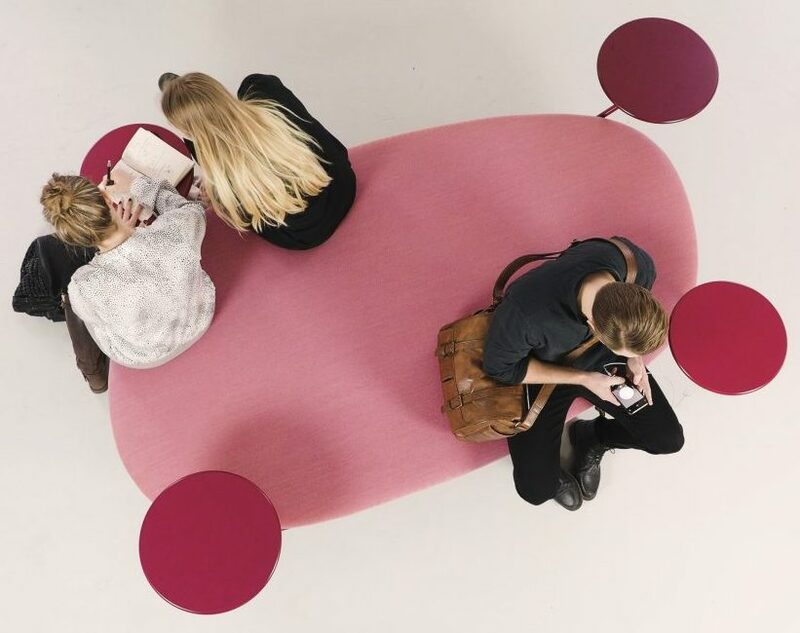 Dune garnered considerable attention as a prototype under development in the Offecct Lab when it was exhibited at the Salone del Mobile in Milan in 2017. Dune was officially launched at the Stockholm Furniture and Light Fair in February 2018. We are really satisfied with the lightness of Dune. This is, after all, a large piece of furniture that easily can seat up to eight people. Despite being so delicate, Dune stands firmly on the ground. Its legs not only support the asymmetrical seat, they also rise above it to hold four table tops that can be equipped with the latest-generation USB sockets. The ottoman offers users a comfortable “touch down” with possibilities for interaction, both face-to-face and digital. “Dune is an oasis that comes to life when used,” says Anders Englund, design manager at Offecct, answering his own rhetorical question about what this new furniture typology from Offecct is. For more photos and information about Dune, visit the Front Web site. Since 2017, Offecct has been a part of the Flokk Group, a European designer, developer and producer of workplace furniture.